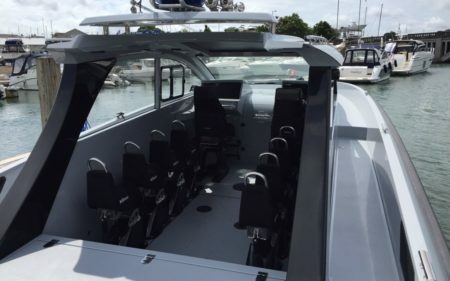 Ullman DynamicsNewsBladerunner 45GT & 45 Interceptor from Ice Marine! Bladerunner 45GT & 45 Interceptor from Ice Marine! The BR45 GT is the latest platform from the ‘Bladerunner’ range and takes design and power to a new level. With three inboard diesel engines, the BR45GT is capable of comfortably cruising in speeds around 40-50 knots. This is also achieved with the latest suspension seating – featuring four Echelon seats with armrests and longitudinal sliders. 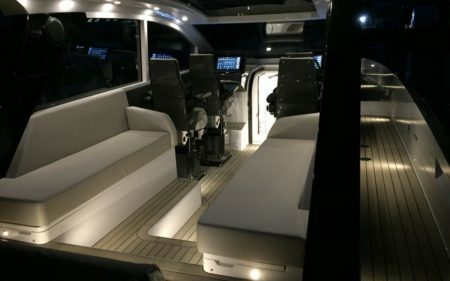 All the seats have customized upholstery according to customer’s preference. The BR45 GT will be displayed at the Yachting Festival in Cannes 11-16 September – At stand PAN049. The BR45 Interceptor is powered by three 550hp inboard diesel engines driving through triple Arneson surface drives. The platform specification can be tailored to suit the application and customer requirements, with further options for petrol or diesel, twin or triple engine configurations. The BR45 Interceptor can achieve a top speed around 70 knots and able to carry 2 crew and 12 pax.